We have become inured to the Russia investigation, and the lack of focus on the National Rifle Association’s centrality to it is proof. What began as a frenzy in 2017 has become just the normal background noise to daily life (which is probably a good thing, given that the frenzy leads to events like unhinged conspiracy theorist Louise Mensch getting space on the New York Times op-ed page and face time on MSNBC). On Friday, Robert Mueller and the Southern District of New York filed 37 pages of information about how astoundingly guilty Michael Cohen is, and they named “Individual 1” 30 times (they also said that “Individual 1” became president in 2017). That filing made it clear that Trump is in serious danger of being charged with a campaign finance felony, and the response from all of us seemed to be a collective shrug. Had those 37 pages come out in early 2017, cable news would have spontaneously combusted. Maria Butina, a Russian national who cultivated relationships with powerful American conservative activists, agreed Monday to plead guilty to conspiring to violate laws prohibiting covert foreign agents. As part of her agreement, which was reviewed by The Daily Beast, she has promised to cooperate with American law enforcement. As a result of the deal, Butina will become the first Russian national since the 2016 election to plead guilty to a crime connected to efforts to influence American politics. After running a gun rights organization in Russia, she moved to the United States, where she spent years building relationships with conservatives in hopes of influencing a future Republican presidential administration. During the campaign season, she questioned then-candidate Donald Trump about sanctions; built relationships in the upper echelons of the American gun rights community; arranged for NRA leaders to travel to Moscow; and bragged that she was a channel between Team Trump and the Kremlin, as The Daily Beast first revealed. I’ve been involved in securing a VERY private line of communication between the Kremlin and key [unnamed political party] leaders through, of all conduits, the [unnamed gun-rights organization]. So if a longtime Republican operatives e-mail is to be believed, a back channel existed between the GOP and the Kremlin through the NRA (it’s hard to see how the Republican operative could have been talking about any other [unnamed political party] and [unnamed gun-rights organization]). That longtime GOP flack received a job offer from the Kremlin, and struck up a romance with a woman who admitted under oath that she was working at the direction of Alexander Torshin, the deputy governor of Russia’s central bank whom the FBI has been seriously investigating. 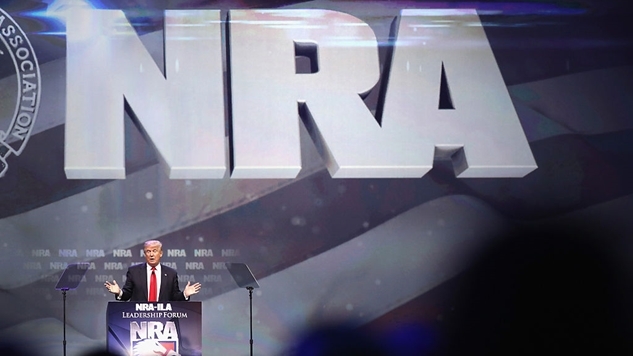 Combined with Trump being named in campaign finance violations on Friday and Isikoff’s report that the FBI has obtained wire taps of Torshin speaking to a Russian money launderer and that Don Jr. “should be concerned,” it sure looks like a gigantic legal storm has arrived at the NRA’s doorstep. The GOP’s refusal to probe this branch of the Russia ordeal is yet another red flag that this could be a big, big deal once we know the details of Butina’s work with the NRA. GOP stopped Intel Committee interviewing her. Butina will be in protective custody for the rest of her life, which demonstrates how scared she is to go back to Russia (it also means that she has some incredibly useful information to federal investigators). While we don’t know the exact violations that the NRA is potentially facing, the overall picture looks horrible for them. Both Robert Mueller and SDNY have named the president as complicit in campaign finance violations pertaining to paying off mistresses—which may demonstrate that they believe they can charge a sitting president with campaign finance crimes. This matters to the NRA because campaign finance crimes are what the McClatchy report said the FBI was looking into with the Kremlin and the NRA. The larger picture of the NRA’s complicity in the Russia mess of 2016 is beginning to emerge, and if you work at the NRA and don’t have a lawyer yet, you should get one ASAP. Mueller’s comin’.